The purpose of this page is to share documents and recollections about the early history of civil spread spectrum policy and systems. Today's civil uses include Wi-Fi, Bluetooth, CDMA cellular, and 3G cellular systems. However, in the 1970's and early 1980's any civil use seemed doubtful. The conference proceedings cover shown at the right confirms that as late as 1991 there were real questions about its viability in the commercial world. 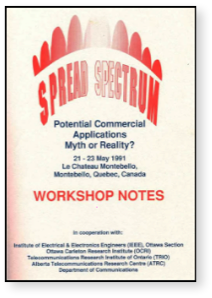 A great source of information on early commercial spread spectrum are the papers from the internet Economy Project's April 2008 conference where many pioneers spoke. Like computer technology, spread spectrum technology has a long complex history with no clear single "eureka" moment or inventor. The Hedy Lamarr story of invention is charming, has some historic basis, but appears to have been a technological dead end. Military R&D at MIT Lincoln Laboratory, Sylvania Electronic Systems, and Magnavox Government and Industrial Electronics for jam-resistant and covert communications systems produced many of the key technical details and early military systems such as the AN/ARC-70 and AN/ARC-90. However, parallel radar technology -- where the concept is called "phase coding" -- also had an impact. But since most early work was classified, the origins were confusing for a long time. The 1976 publication of Spread Spectrum Systems by Robert Dixon was a significant milestone in the commercialization of this technology. Previous publications were either classified military reports or academic papers on narrow subtopics. 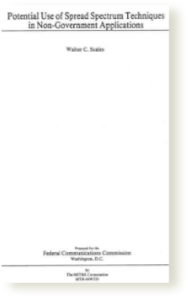 Dixon's book was the first comprehensive unclassified review of the technology and set the stage for increasing research into commercial applications. I got involved in spread spectrum technology in depth in 1975-79 while working at the Institute for Defense Analyses, a Pentagon think-tank, on options to protect military units from communications jamming. Events in the 1973 Mid East War had raised concern in the US military about this issue - which had been neglected since WWII. The late 1970's were an era of deregulation for the Federal Government. The thinking of Alfred E. Kahn on the benefits of deregulation were influential throughout Washington. FCC Chairman Charles Ferris wanted to decrease the role of FCC and stimulate new services and technologies. He was concerned about promising technologies that were being held back by anachronistic regulation that discouraged their consideration and the capital formation necessary for their further development. 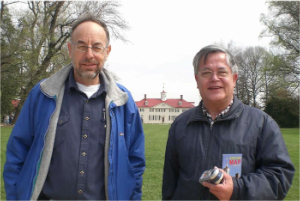 Ferris' new technical czar, former (D)ARPA Director Stephen Lukasik, and I met in the summer of 1979 at an Army-sponsored meeting on electronic warfare issues. We had met several years earlier when he was Director of ARPA (now DARPA) and I was a junior Air Force officer spending his money on underground nuclear test detection research. Interested in my thoughts on EW issues, he asked what new technologies should the FCC be thinking about for removing unnecessary barriers. Thinking for a while, I responded: spread spectrum, adaptive antennas, and millimeter waves (frequencies >30 GHz). I soon had my ticket out of the military industrial complex and into FCC. Initial commercial use of spread spectrum began in the 1980s in the US with three systems. Each was authorized by FCC based on narrow specific circumstances. Two were satellite systems in which the satellite operator already had effective ownership and management of the frequencies involved. But general spectrum management policies in the US and elsewhere made spread spectrum use in other contexts doubtful and the general technical consensus was that CDMA had inefficient in the real world. - Equatorial Communications System's very small aperture (VSAT) satellite terminal system for newspaper newswire services. Chairman Ferris approved the spread spectrum initiative that Dr. Lukasik and I proposed to him. The basic goal was to remove regulatory barriers to spread spectrum and CDMA in order to encourage R&D on practical systems, while maintaining interference protection for conventional users. As specific systems were developed they could be considered on their merits. But if FCC did nothing it was feared that the "regulatory risk" of approaching the FCC "cold" was so great that it discouraged investment and R&D. The MITRE report, written by Walt Scales, has the first written reference to the possible use of the ISM bands for spread spectrum commercial applications (p. 3-25 to 3-29). However, it does not explicitly mention unlicensed use of these bands as the report focused on technical issues. 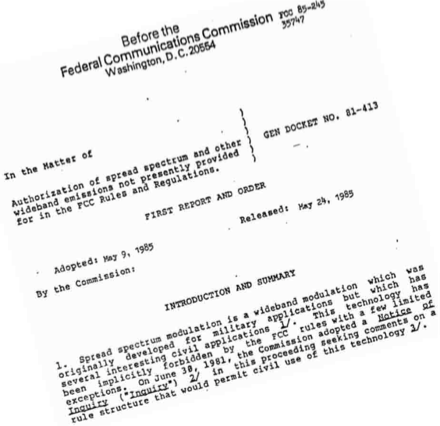 Following the MITRE report, FCC staff prepared a Notice of Inquiry under my direction and it was approved on June 30, 1981, initiating Docket 81-413. A parallel proceeding, Docket 81-414, examined spread spectrum in the context of amateur radio. While today's FCC dockets are online and the FCC documents and public comments can be reviewed through the FCC website , documents from this era are only available by special request to the National Archives through FCC. Basically most of the comments were very negative -- foreshadowing what would happen two decades later in the context of ultrawideband (UWB). Part of the NOI was similar to the later idea of UWB "underlays". 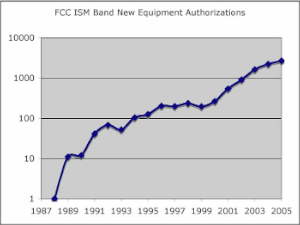 The world's first general authorization for civil spread spectrum was in the May 1985 in FCC Docket 81-413. This included the rules that Wi-Fi, Bluetooth, and the majority of cordless phones sold in the US operate under. May 9, 1985 FCC discussion of Report & Order on spread spectrum technology - world's first general authorization of civil spread spectrum/CDMA! Qualcomm was incorporated a few weeks after this FCC decision. While the decision did not formally affect CDMA for cellular - that would come as part of the deregulation of 2G cellular 3 years later -- the positive statements about CDMA in the decision are said to have helped the capital formation for this technology that is now used in both 2G CDMA cellular and 3G cellular/IMT2000. Unfortunately the internal FCC response to May 1985 decision was not positive. The new type of unlicensed system that as created was threatening to many people both inside and outside of FCC. As a result there was a major reorganization of my office that seemed engineered to displace me and within 6 months of the decision I was transferred to an ill defined position in the enforcement arm of the FCC where I was to stay for about 7 years until I rode back "on a millimeter wave". (e) The processing gain of a direct sequence system shall be at least 10 dB. The processing gain shall be determined from the ratio in dB of the signal to noise ratio with the system spreading code turned off to the signal to noise ratio with the system spreading code turned on, as measured at the demodulated output of the receiver. It is ironic that this provision - not in the original 1985 rules - came close to blocking Wi-Fi's access to market as questions were raised inside and outside FCC about whether the 802.11b waveform actually complied. No one formally opposed approval of the Wi-Fi waveform - not even the HomeRF community that was developing Wi-Fi-like alternative at the time. In what was euphemistically called by a lawyer for one of the parties "an undocketed proceeding", FCC decided not to pursue this issue. The way for Wi-Fi was cleared! A few years later HomeRF asked for a rule change to permit increased data rates and the Wi-Fi community strongly opposed the change at FCC, delaying any action for more than a year. 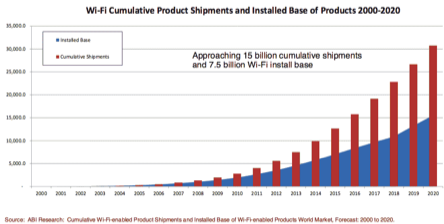 During this period Wi-Fi got a strong market foothold and HomeRF "fell by the wayside". "But the FCC, prompted by a visionary engineer on its staff, Michael Marcus, took three chunks of spectrum from the ISM bands and opened them up to communications engineers"
"Despite these naysayers, Mike Marcus persisted. I clearly recall the meeting with Mike in which he convinced me that I should put the adoption of these new policies before the entire Commission for an up or down vote. I did so, and the Commission adopted the new Part 15 rules. " 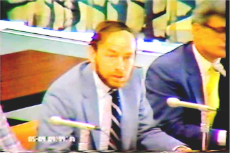 Presentation by Vic Hayes, Founding Chair of 802.11 at March 2004 meeting of IEEE 802, "Impact of (FCC) Spread Spectrum Rules on the Wireless IEEE 802 standards"
"Michael Marcus is an improbable revolutionary. An MIT-trained electrical engineer, he spent three years as an Air Force officer during the Vietnam war, designing communications systems for underground nuclear test detection at a time when the ARPANET—the original, military-sponsored version of the Internet—was first in use. ...In the summer of 1979, Marcus attended an Army electronic warfare workshop. As was typical at Army events, attendees were seated alphabetically. Marcus’s neighbor was Steve Lukasik, the FCC’s chief scientist. Lukasik had been Director of ARPA during the development of the ARPANET and then an ARPANET visionary at Xerox. He came to the FCC, not generally considered a technologically adventurous agency, because Carter administration officials were toying with the idea that existing federal regulations might be stifling innovation. Lukasik asked Marcus what he thought could stimulate growth in radio communications. Marcus answered, among other things, “spread spectrum.” His engineering was sound, but not his politics. People would not like this idea." "... others familiar with spread spectrum lore paint a compelling picture of Marcus, who emerges as a regulatory Robin Hood, the guy who saw the potential of unlicensed spread spectrum devices to liberate radio from the ruling forces." " One of my favorite blogs, and a perfect illustration of how blogs have completely changed the publishing industry by allowing unfiltered propagation of incredibly valuable insight is SpectrumTalk by Michael Marcus. Those who know Marcus' work at the FCC hold him in reverence; at least I do, especially for his amazing prescience of the potential of license-exempt spectrum allocation and spread spectrum technology." "In 2014, Raul Katz, a professor at Columbia University, estimated that by this year unlicensed spectrum would contribute $547.22 billion in economic surplus annually and nearly $50billion to the annual GDP. He arrived at that estimate by building on hi historical assessment of unlicensed spectrum’s economic value in 2013 ($222.4 billion in total economic value and $6.7 billion contributed to the GDP) and analyzing two key drivers of growth in the area." Op-ed by FCC Comm. Mike O'Reilly 6/19/17 "This World Wi-Fi Day, let's celebrate the progress we've made"
"To say that Wi-Fi is a critical component of Internet access in today’s always-connected society doesn’t do it justice. Every day, Wi-Fi handles more than half of all Internet traffic and brings wireless Internet availability to billions and billions of devices. It connects individuals to home networks and throughout work settings. It’s nearly omnipresent and often offered for free in coffee shops, libraries, airports, universities, hotels and many other places, delivering fast download speeds and once unimaginable bandwidth capacity. And, we can’t ignore its contributions to overall economic productivity, which can be likely measured in the hundreds of billions or trillions of dollars produced and man-hours saved." 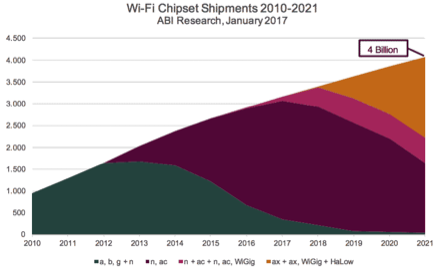 "The rapid adoption of Wi-Fi has pushed prices down and allowed entrepreneurs in developing economies to use off-the-shelf equipment to quickly roll out wireless networks. These new wireless networks usually operate in license-exempt spectrum bands. 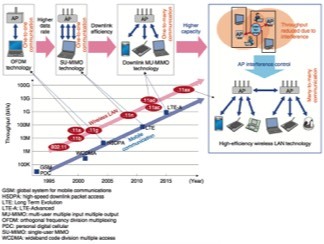 Policy makers can help spur innovation in these wireless networks by making certain frequency bands license-exempt..."
Evolution of Wi-Fi technology and comparison to cellular evolution. "Installed Base of 4 Billion Products with Bluetooth Technology"
FCC Chairman Charles Ferris - who had the vision to gather a team on technology and policy and challenge them to remove barriers to new technology. Stephen Lukasik, former Chief Scientist of FCC - who had the vision to hire me, challenged me to identify the roadblocks to new radio technology, and supported me during the early stages. Elliot Maxwell - who supported the vision and tried to teach me how Washington really worked. Robert Powers - successor of Steve Lukasik as FCC Chief Scientist, who continued to support the initiative even though it proved not to be "career enhancing" for either of us in the short term. Marjorie "Peggy" Reed Greene - successor of Elliot Maxwell as Deputy Chief Scientist who was always a source of pragmatic advice. FCC Chairman Mark Fowler - who recognized that this type of deregulation also fit the Reagan agenda and supported it even though industry was rather negative. 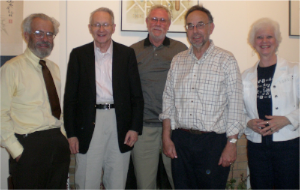 Arthur Feller, Michael Kennedy, Joseph McNulty, John Reed and Dan Yates - who worked with me to draft the FCC agenda items that implemented the policy.